Mini’s Rugby – Let’s Play! Spring is here, which means mini’s rugby is kicking off soon! If you have kids who want to play a safe and fun outdoor sport and make new friends, try rugby! If you have any questions, contact VP Kate Elizabeth for more information. Compensation: $600/month with a bonus of $450 payable at the end of the term, contingent on the completion of the contract terms. Posting will remain open until March 21st, 2019. For more information, please see the attached job description file. May 3rd, 2019 is the annual Pirates High School 7’s Tournament. See the link below for registration and tournament information. Hope to see you there! Introducing our 2019 Senior Coaches! We would like to extend a warm (and very excited) welcome to our 2019 Senior Men’s and Senior Women’s coaches: Roger Coombs and Katherine Martin! Award-winning coach Roger Coombs will be joining Pirates as the 2019 Senior Men’s coach. He hails from the UK and will be arriving in April 2019. Coaching rugby since 1974, he has been taking ruggers world wide to their peak in Wales, England, Italy, the USE, the Bahamas, South Africa, Nigeria, and Pakistan. Mr. Coombs has coached famous teams such as the London Irish, Woodbridge, Suffolk, the London Welsh, Boca Raton, Cowrie and formed and directed national teams for both the Bahamas and Pakistan. Heavily involved in grass-roots rugby, he has also coached all ages from minis to seniors and both men’s and women’s sides, and has brought many a school, club and representative side to championship seasons. Roger has been awarded the Welsh Rugby Union Coach Award, taken the U19 Pakistan team to a national win, been an active “coach the coach” member and has formed many a team across the globe. An experienced rugby coach, he also brings with him a passion for the sport and a desire to help grow rugby in Pirates and Edmonton. We are very excited to welcome Roger to Pirates RFC and to Canada. We are also extremely happy to announce that Katherine Martin will be returning as the 2019 Senior Women’s coach. A lifelong Pirate , Kady debuted in 2018 as head coach after retiring as a seasoned player since 2001. Intro to Competition Certified, she has been spotted working with some of Alberta’s best known coaches, including those found at the U of A, Edmonton Gold and Wolfpack, developing her coaching skills. The 2018 season finished out with our AWP women finishing in 3rd place overall, with an improving score over the previous season. Kady also coaches several rep players on the Pirates AWP side, including those at Edmonton Gold, Wolfpack and Team Canada U20, who trust her skills to get them to their rugby goals. Having taken the premiership Pirates women to semi-finals last year, we know that Kady is a winning bet for our club. She has also coached the mini’s for several years and has been an active board member in the past, proving that her love of Pirates, rugby and coaching extends into her past and future. 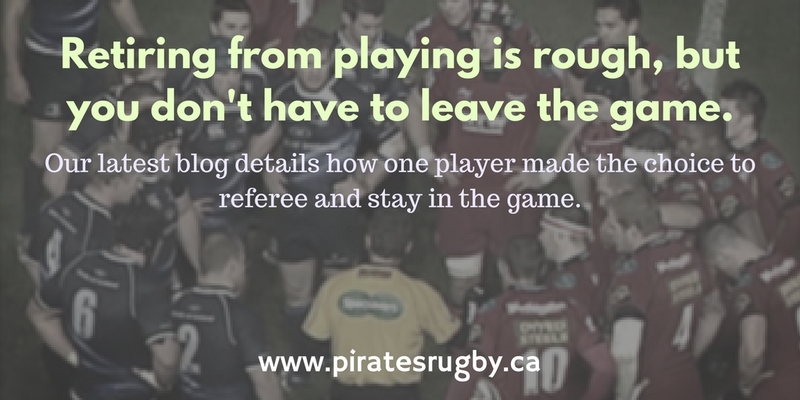 If you’d like more information, contact info@piratesrugby.ca. Welcome to our Coaches! Indoor Training Has Begun! Now Recruiting for the 2019 Season! With the new year comes indoor training. Pirates invites anyone interested in trying out rugby to join us at one (or all!) of our sessions. They are FREE and NO EXPERIENCE is necessary, so it is an excellent opportunity to give rugby a try if you are new to the sport. Please see the dates and locations listed below. Want to watch some rugby and drink at a bar with no cover? Wanna make some extra money for the team through drink tickets? Come be social with Pirates to watch some 6 Nations games at Urban Tavern. Tickets are $5 and include one drink, and can be used on any match day throughout the entire tournament. So feel free to grab several for each weekend! Link to the Facebook event is here. Contact Aiden Cottrell for your tickets, or request via social media pages or grab some at any upcoming Pirate event. February 9th, 2019 is Pirates Day! We will be hosting and have a draw 50-50 with all proceeds going to support the club. On March 16th, 2019 we will have a chance to win 10 new balls for the club courtesy of United Cycle if we have the most people show up to represent Pirates. Fun facts: Kids are allowed in the bar until 6:00pm so parents can bring the minis, juniors and rep munchkins as well. Brunch is served until 2:00 pm with full drink menu from open till close! Download the TeamApp today for Pirates info straight to your phone! For a one stop shop on your phone for all your 2019 Pirates info, download the Team App from https://www.teamapp.com/app. Just search for “Pirates RFC” and create an account. The events calendar will have all Pirate social events, tournaments and volunteer opportunities posted while the schedule calendar will have all practices and games and the ability to sort by team included. The app will integrate the schedules and events you choose into your phone calendar. You can set it up to send you push notifications to your phone for any event or schedule you’d like, so you’ll never forget a training, game, volunteering or party. The app also has integrated maps functions, so you will always know where you are headed! We also have linked access to registrations, all your needed documents available, links to photos and newsletters and easy access to all other Pirates social media and webpages. Rentals will be incorporated for 2019, so if you are interested in renting the property you will be able to see blackout dates in advance to assist with your bookings. It’s amazing how a phrase can change meaning to a person over time. When I started playing rugby, years ago, I had Dave Bailey tell me that… and I hated it. What that phrase meant to me was I wasn’t going to win any argument I had at the time with the referee that had just said it to me. I started playing rugby when I was 16 years old as a way to hang out with friends and be able to take out physical aggression without getting in trouble for it. After a couple years break after junior rugby I managed to let someone talk me back into the game. I have had some of the best times of my life playing rugby. I have met lifelong friends from around the world, and obviously from here at home, I have learned more about myself in my time on the pitch than I would have ever thought would be possible from a sport. I loved the feeling of waking up on a Saturday morning, nervous and excited to play the match we had trained all week for. Even the drive to the pitch had it’s excitement for me, and the feeling I’d get the moment I’d see the posts as we pulled up was usually accompanied by a drop in my stomach I learned to love. I usually liked to get to the pitch early on game days to settle in and see the rest of the team arrive. It really is something to see each guy you’ve trained with show up on game day switched on in their own individual ways. The forwards usually show up with an intensity that is brought on by their need to hit someone, and the backs seem to arrive with a jovial attitude – laughing and keeping loose… for the most part. When I was younger, I hated the nerves. They used to almost make me sick before each kickoff, just simply anticipating the match, and they always stayed until the first hit of the match, and then for the next 80 minutes nothing in the world mattered but what was on that 100×70 meter piece of land. 80 minutes of aggression, strategy, teamwork, and fun. I loved the game – almost to a fault as my wife would say – and was primed for another great season. I had trained through the winter, actually improved my cardio (and I HATE cardio) and felt great about the upcoming season until, in the time it took to break the defensive line in a seven’s match and throw a stiff arm, my future in rugby changed. I ended up getting tackled during the stiff arm and felt something weird in my shoulder. I called for a sub and walked to the trainer on the sideline telling her for some reason I wasn’t able to lift my arm up anymore. I had been hurt a few times before during games, so I figured that I would drink it off for the day (it was rugby fest after all) and after a few weeks I tried to play in another league game… It didn’t go well, as I dislocated the same shoulder. I went through this same routine for the next month or so until I finally took some advice and went to a doctor. What I had done weeks before turned out to be a torn labrum and a piece of bone broken clean off, resulting in surgery to repair the labrum and 5 screws to hold everything together. My rugby playing days were effectively done. I found out over the next year or so anything I thought was tough while playing – the training, the matches, getting up in the morning feeling the pain from everything, even the hangovers – nothing was tougher than having to watch from the sidelines. I stuck around the club for a season to help as much as I was able to, but eventually having to watch was getting harder and harder – especially as I started getting healthier but knowing that I wasn’t able to play. The need to do something in rugby became increasingly more prominent every time I was anywhere near a pitch. I had coached in previous years and loved doing so, but I didn’t quite have the time or the best schedule due to working a shift that occupied my later evenings and nights more than 50% of the time. I decided to take an offer that had been extended out numerous times from our local refereeing society to all of the rugby clubs in the city, as they’re always looking to increase the number of younger referees in the sport. I accepted the offer to take a level 1 course in the city, if for nothing else to gain a different view on the interpretation of the rules from a refereeing perspective. It’s always been an unwritten rule in rugby, and sports in general, to “play to the referee” so learning how a referee sees the game I figured would be beneficial if I was lucky enough to be able to play or coach again at some point. Of course, once the course was complete, I was tossed into my first high school tournament to ref. The first couple of matches in my first tournament went off without a problem, but I quickly found out what the biggest hurdle would be for my transition from playing into refereeing. Normally in my past experience, when something would go awry in a rugby match while playing, we had been taught to “sort it out” on the pitch, whether that be waiting for the perfect time to make a big hit, or otherwise. In my third match of refereeing I made a call that was, at best, questionable and heard it from the receiving team’s coach. I was stunned… furious… and rattled. I knew I was in a position where I had to be professional and uphold the standard of the game, but at the same time I wanted to lash out at the coach and put him in his place. It was then I knew there was going to be a transition period from player to ref. Through my relatively short time referring I have learned there are what I consider to be four ways to interpret every rule and call made on the field. The fan, coach, player and then the ref. I always thought as a player and coach I knew the rules of rugby fairly well, well enough that I had no problem yelling at the referee when they made a call that I didn’t agree with, but that way of thinking changed when I picked up the whistle. When I initially started refereeing, I didn’t think it would be a long term hobby. I thought I would get certified and it would be just another course under my belt, as I didn’t think I would like it enough to spend an abundance of time doing. As I started to get a few more matches under my belt I became more comfortable on the pitch with the whistle, making calls (correctly) and started to find more and more enjoyment out of reffing. One of the things I didn’t enjoy at the beginning of my time reffing was the singularity of being out on the pitch without the support of a team behind and around me, something I had gotten used to as a player. It’s a “different” feeling when you’re out there on the pitch and have 15 players plus coaches and fans angry with a call you’ve made, and you haven’t got anyone readily backing you up. What I soon realized as I moved forward in refereeing, is the refereeing society is much more of a team than anyone may know or realize. What kept me coming back to the Edmonton Rugby Union Referee Society was the emphasis they put on inclusion of their members. Once I was introduced to a few of the other referees, they were thrilled to have me and treated me as someone they wanted to keep around for a long time. I had multiple offers for coaching, members constantly offered tips and advice to help me along the way to getting comfortable as a referee on and off the pitch. Through refereeing I have already had the opportunity to have many coaching sessions from highly ranked mentors from within the province as well as national panel members, but most recently I was fortunate enough to be sent down to Sacramento California to attend a referee coaching seminar led by some high level members of the USA rugby refereeing community and actively referee the largest high school level tournament that included the previous national varsity champion sides. Having the opportunity to ref younger generations with such a high ceiling while getting actively coached on my ability and refereeing skills allowed me to further improve my game and build confidence in myself on the pitch. Going into the 2017 rugby season, I now consider myself almost completely transitioned from player to referee and can notice the changes in the way I see the game being played. When I watch pro level rugby it’s funny to find myself seeing more of the pitch, challenging myself to make the calls that are being called on the field. My pre-season prep has changed from preparing for the physicality of the game as a player to the agility, continuous movement, and knowledge of the law book required as a referee. I find myself being able to plan more of my summer to camp with my family due to the more flexible schedule refereeing accompanies. Continuing to ref has allowed me to keep challenging myself to improve my knowledge of the game, fitness, and professionalism when representing the game. I may not be playing the game that I love first hand but I still get to be a big part, interact with the players, and keep up with the sport I’ve been enthralled with for the last 17 years. — Thanks to our latest blogger, Thomas Hyland. While we are a little late posting the blog, it is with good reason — he is now a first time dad and was reasonably delayed by all the cuddling and golf watching he’s been doing with his new son. The Pirates would like to extend our sincerest congratulations to him and his wife on their new addition and can’t wait to see him out at the club. For more information on becoming a referee, please contact the Edmonton Rugby Union Referees’ Society (erurefsociety@gmail.com). They also have Level 1 Referee Clinics coming up soon on April 27, with a high school tournament April 28/29 and May 4, with a high school tournament May 5/6. Check out the Edmonton Rugby Union website for more details. Rugby is played in seasons, and in Alberta, that means outdoor practice starts in April, and the season wraps in September. Six months is all we get here. I know that there are things done to extend the season – sevens series, CIS season in the fall, and snow sevens are a few of the ways that we try to squeeze as much rugby as possible into the year, but ultimately, rugby is played in seasons. Rugby has also been played in almost all of the seasons of my life. I’ve been lucky to be involved in the game in many different roles and ways. I started my career in high school, which led me to play other team sports in high school. I’ve played strictly for fun, and I’ve played for competition. I’ve recruited my sister to play with me. I’ve stood pregnant on the sidelines and watched my team win a city championship. I’ve stepped back onto the field within a month of having my daughter. I’ve coached high school, club, and representative teams. I’ve refereed. I’ve held administrative positions. I’ve volunteered in many different capabilities. I’ve been a tournament organizer. I’ve been a mom of rugby players. I’ve been a mom that is also a rugby player. I’ve had my kids on the sidelines cheering me on, but unable to recognize me because of the scrum cap. I’ve played and got really fit, and I’ve played less fit. I’ve been a captain, and I’ve been a manager. I’ve played for two different clubs, and worn many more jerseys than that in the spirit of getting a game going. I’ve played every position in the pack, and everything in the backs except for fullback (I was a wing in grade 10). I’ve watched the club expand their women’s side to two teams, and I’ve played in years where we couldn’t field a full 15 players for games. I’ve been on tour with the women’s team, as a club, as a coach, with the men’s team. I’ve acted as a trainer for the Pirate teams. I have made my very best friends in this sport, and these friendships have lasted for years, even as our own relationships to rugby have changed. I have covered myself with rugby, in every possible way that I have found. Over the course of my rugby career, I’ve changed from an awkward, 15-year old high school student to a confident, outgoing 33-year old with two children. And in that time, rugby has always been able to meet my needs, no matter the season of my life. It fulfilled my need to build confidence when I was shy and awkward and it’s given me a place where I can work on building the confidence of others. You can only win rucks when you are confident. It fulfilled my need to be a leader in many capacities and this experience has prepared me for the work that I do now. It has also made me a better follower after having had a leadership role, because I have a greater understanding of the demands that leadership places on people. It fulfilled my need to find something to do with myself that was physical, but also social. It is always there for me, regardless of my current level of fitness, and my teammates are some of the most supportive people around. It’s there, pushing me to do better. It shows my kids that all body types contribute and are valued in this sport. It has fulfilled my need to stay involved when sidelined by pregnancy, to be involved after I’ve had children, and has given me a place where I can bring the kids and they will be greeted by everyone in the building. It’s a place where my kids feel safe and have fun, knowing that there will be a couple of other kids looking for activity. It’s allowed me to share something that I love with my kids, and to watch them pick it up with the same joy and abandon that I have. Minis rugby is a great way for kids to experience the game for the first time, instead of waiting until high school. In all the seasons of my life, rugby has been exactly what I need it to be. Check us out and see what it can be to you.